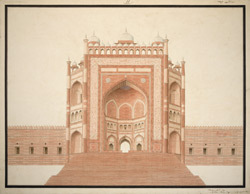 Watercolour by Latif (fl..1820s) of the Buland Darwaza or 'Gate of Magnificence' at Fatehpur Sikri in Uttar Pradesh, dated between 1820 and 1822. The image is inscribed on the front in English: 'Gateway at Futtipoor'; and in Persian characters: 'Darwazah i Fathpur 'amal i Latif' (Gate of Fatehpur. The work of Latif). The Buland Darwaza is set into the south wall of the main congregational mosque at Fatehpur Sikri, the city built by Akbar the third Mughal ruler of India (r. 1556-1605). The huge gate has two inscriptions in the archway, one of which reads: 'Jesus Son of Mary (on whom be peace) said: The world is a bridge, pass over it, but build no houses on it. He who hopes for an hour may hope for eternity. The world endures but an hour. Spend it in prayer, for the rest is unseen.' The central portico comprises three arched entrances. The largest one, in the centre, is known locally as the Horseshoe Gate, so-called because of the custom of nailing horseshoes to its large wooden doors for luck.